A Family’s Values, and its Legacy "This is meant to be our ongoing legacy." Whether you have a firm idea of what you hope to accomplish with your philanthropy— or an idea that’s just taking shape—the Community Foundation of the Great River Bend can help you achieve your philanthropic goals. Gifts to the Community Foundation come in all shapes and sizes. Cash, securities, closely held stock, business interests, and real estate have been used to establish charitable funds. Whatever the asset, each and every gift is an important contribution to the Community Foundation’s work. Whether you chose to make a gift during your lifetime or are considering a planned gift, the Community Foundation is here to make sure your wishes are clearly understood in the present so they can be carefully carried out now and forever. Both Eric and Laura serve as volunteers on the Foundation’s community impact grants panel and Eric interacts with the Foundation through his work, so they knew the process would be seamless. A message from Sherry E. Ristau, President/CEO The Community Foundation of the Great River Bend encourages everyone to consider giving back to our Regional Community and creating a legacy. These words are at the heart of what we do every single day – facilitating philanthropy, and serving as a bridge joining people with passion, commitment, and a collaborative spirit to challenge the status quo for the benefit of our hometowns. 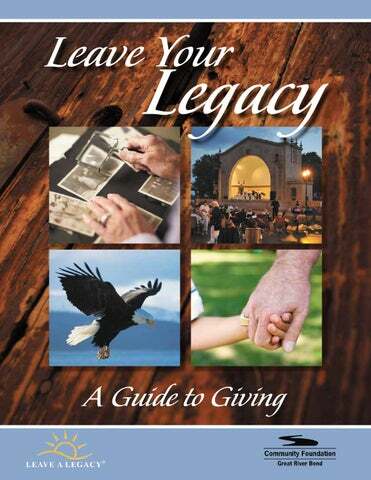 As you enjoy this issue of Leave Your Legacy, A Guide to Giving, consider what you want your legacy to be and what difference you want to make in our Regional Community. And then let us help you make your dreams a reality. Family is very important to Eric and Laura Kies. Daughter Maddox carries Laura’s mother’s maiden name, and son Kennon carries Eric’s mother’s maiden name. And as a family, their ongoing commitment to the community is also significant. CHARITABLE REMAINDER TRUST You transfer your cash or appreciated property If you own cash or property, you can make a gift to a charity, save taxes, and provide yourself with annual payments. Transferring appreciated property to a charity allows you to save taxes twice. You avoid capital gain taxes while the charity receives the full value of the property. Education has always been important in Dave and Jenee (Nelson) Dettmann’s family. Specifically, a college degree from the small liberal arts school, Luther College, is held in high esteem. More than three generations of Dettmanns and Nelsons have graduated there. And, of course, it was there that Dave and Jenee met. Fast forward to the present: “All three of our children and their spouses also graduated from Luther,” states Dave. “Because education is important to us, we set up a scholarship fund with the Community Foundation of the Great River Bend,” Dave relays. “It benefits students from the Quad Cities who want to attend Luther College, but who may not have the ability to pay for it.” Due to his 35-plus years of professional work and affiliation with the Community Foundation, Dave knew that establishing the scholarship would be seamless and the family’s intentions would be honored. With the added incentive that the state provides through the Endow Iowa Tax Credit, the Dettmanns are able to give more to the scholarship. “That credit played an important part in our decision,” says Dave. Dave and Jenee hope the fourth generation, their six grandchildren, will follow in the family footsteps as the next graduates of Luther College. And with their scholarship gift, the Dettmanns ensure that many future Luther College graduates will have the opportunity to thrive and succeed. Similar to a private foundation but with greater tax benefits and cost savings, a Donor Advised Fund allows you to time your charitable deductions for when you want them. You can avoid capital gain tax on your gifts and recommend grants from the fund to favorite charities whenever you want. to fund a charitable trust. The trust provides you or named beneficiaries with payments for life or a specified term of years after which the charity receives the balance of assets in the trust. You transfer property, such as real estate or shares of stock, to a charity and receive a tax deduction for the value of the property on the date of the transfer. As the owner of the property, the charity can sell them or retain them as part of their portfolio. You work with an organization that accepts donor advised funds (e.g., a community foundation or others) to set up your fund. Once you transfer appreciated property or cash, it is invested and you may recommend grants from your fund at any time. The organization takes care of all the administrative steps while you enjoy giving! You designate an organization or multiple organizations as the beneficiary of your life insurance policy or as the owner of your policy. Allows you to make a charity the beneficiary of your life insurance policy when your heirs do not need the proceeds. Allows you to make a charity the beneficiary of a retirement account or to transfer assets from a retirement account to a charity if you are older than 70 ½ years of age. WILL OR LIVING TRUST BEQUEST Allows you to maintain control of your assets during your lifetime and make a gift to charity when you pass away. An agreement through which you make a gift of cash or appreciated property and a charity agrees to pay you fixed payments for the rest of your life. Transfer assets from a retirement account either • Gives your loved ones assets that step-up in upon your death by naming a charity or charities basis at your passing and are not subject to as a beneficiary or, if you are older than 70 ½, you income tax while giving charity the full value can transfer assets from your retirement account of your retirement plan assets to a charity. It is even possible to create a • Save your heirs from income taxes, capital charitable remainder trust with retirement assets. gain taxes and potentially estate taxes • Easy to accomplish and you retain the assets during your life in case you need them You designate an organization or organizations as • Estate tax charitable deduction the beneficiary of your assets in your will, trust, or • Life use and control of your property beneficiary form. You can specify a dollar amount, • Overcomes fear of “outliving” your assets a percentage of your estate, or the remainder of your estate after your other bequests. A Charitable Gift Annuity is a contract between you and a charity. In exchange for a gift of cash or property, the charity agrees to make fixed payments to you for the remainder of your life or for your life and the life of another. The payments can begin immediately or at a specified future date. The Illowa Partnership for Philanthropic Planning thanks Laurie Boyce-Steinhauser for authoring the personal profiles found on pages 2 through 14. Doing good. Mike Plunkett’s desire to do good supports a local college and university, a child-centered organization, his home parish and an Alzheimer’s organization. Mike encourages you to join him. Charitable Remainder Trust With a Charitable Remainder Trust (CRT), you transfer cash, an appreciated asset or other property to a special trust that is invested to generate income for you and any other beneficiaries you select. After all payments have been made, the balance of the trust passes to charity. You can avoid capital gain tax on the sale of your appreciated assets (e.g., stock and real estate) by transferring these assets to fund a CRT prior to any agreement to sell. The trust will sell your assets tax-free and reinvest the funds. When you create a CRT during your lifetime, you will receive an income tax charitable deduction for the remainder portion of your gift to charity. If you establish a CRT as part of your estate plan, your estate may benefit from estate tax savings. A CRT can last for the lifetime of one or more individuals (either yours or others), or for a term of years (up to 20), or for the lifetime or lifetimes of one or more individuals plus a term of years (up to 20). Payments from the trust can be fixed or variable and can begin immediately or upon the occurrence of a stated event. A charitable remainder trust is a great way for you to achieve benefits for yourself and leave a legacy with your favorite charity. The charitable remainder trust can provide income, a tax deduction, capital gain tax savings and support the mission of causes you care about. The perfect opportunity presented itself when Jenny’s parents made a stock gift to the family. Dan and Jenny used the stocks to set up a charitable fund that supports organizations and causes of their choosing. Since it was established solely for charitable purposes, the fund allowed them to show their children the community’s needs and family values. Using appreciated securities to start the fund helped bypass capital gain tax and allowed charitable gifts from the fund to grow. Dan and Jenny gave the children an amount to distribute from the fund to the charities that are close to their hearts, whether it be a camp they attended or an association at which they volunteered. Ensuring that their children understand the importance of benevolent generosity, Jenny says, “We can see the kids really experiencing the joy of caring for others and the thrill that comes with giving.” Not only are Dan and Jenny building a legacy from their compassion that creates a future for their family, but they have also instilled in their children those same beliefs and ideals. Their generosity ensures that their legacy continues for their grandchildren, great-grandchildren and for generations to come. Appreciated Property Avoid paying high capital gain tax on appreciated assets such as real estate or stocks. Making a gift of appreciated property avoids capital gain taxes, and you receive an income tax deduction for your gift. You can make a meaningful gift with no out-of-pocket cash, and your gift can be put to work immediately as if you were writing a check. Or, like the Molyneaux family, you can set up a fund and make gift giving decisions whenever the time is convenient for you. Gifts of appreciated property are a way to save taxes twice while helping others. Whether you are making a planned gift or simply making your annual donations to your favorite charities, it is always more beneficial to use appreciated property rather than cash for your charitable giving. If you make a gift to charity of appreciated property, you can use your cash to purchase similar property again. This time with a new, higher basis - simple and smart planning! With the help of close friends Tom and Karen Getz, Dennis expanded on his parents’ vision of contributing. ”Tom and Karen were the most generous people in town, and they were the ones who taught me that these things don’t operate on smiles and good will. There is a moral obligation to help others.” The Getzes’ influence changed and challenged Dennis. ”There are hundreds of charitable organizations in the region. That’s a huge number, and they are all really good causes. You’ve got to pick out the ones with which you have some sort of relationship.“ Today, Dennis supports many charitable causes through a donor advised fund that addresses and affects the wide gamut of needs in our community. By setting aside these funds and directing them to the charities that mean the most to him, Dennis has made generous gifts that will continue to shape the future of many people in our region. Dennis Norling subtly persuades his students, the next generation of charitable givers, to understand that they have an obligation to help those in need. It’s right there in their budget. Donor Advised Fund Make a gift today that enables you and your loved ones to make gifts in the future. A Donor Advised Fund is like having your own foundation. The fund is invested for growth which permits you to make annual gifts of income and principal to the charities you want to benefit. Many families use a Donor Advised Fund as an estate beneficiary so that they can allow their children or friends to continue supervising the gifts from their fund. Parents appreciate the way that their Donor Advised Fund encourages children to be involved in philanthropy. Donors may use this type of fund to time their charitable giving. They can transfer cash or stock into the fund when it is convenient for them and most tax beneficial. Then they can make grant recommendations from the fund over time to the charities they care about. This allows donors who support multiple charities to avoid having to make transfers of stock to each charity. They can make one transfer into their fund. Donor Advised Funds can be non-endowed with the intent that the fund will be granted out in its entirety over time, or the fund can be endowed and be a permanent source of support for causes the donor cares about. After they placed Gail in her new home, however, they realized, “It turned out to be the best decision for Gail and for us.” Gail received the nursing care and therapy services necessary, and she was able to participate in the community by doing things like attending concerts and going to movies. Gail was even a season ticket holder for the symphony! Life Insurance Gift A gift of life insurance is easier than you think. Often, people have life insurance policies that they no longer need. These policies make wonderful gifts to charity. Simply name your favorite charity or charities as beneficiaries of all or a portion of your policy on the beneficiary designation form. You can also contact your insurance company and change ownership of an existing policy to your favorite charity. This option may provide a charitable income tax deduction. Gail’s many health issues eventually caught up with her, and she died at the age of 48. Leah and John were always grateful for the loving home and affectionate care she received at the residential facility. Like the promise they made at her birth, Leah and John made another commitment: they gave a gift of life insurance to secure the facility’s future. Now families that find themselves in a similar frightening situation can have the peace of mind the Fosters experienced. Their legacy lives on in the support they provided to a place dear to them. Leave your retirement assets to charity and save your children from paying income tax. If you give your retirement assets (IRA, 401k, 403b, pension or other tax deferred plan) to your children, a large portion of it will be taxed. You can designate your favorite charity as the beneficiary of your high-tax retirement plan assets and give your heirs your low-tax assets. Tom was so deeply grateful for his collegiate involvement that he and his wife decided to ensure that other young adults would have that same opportunity. Tom and Jane used a a qualified charitable distribution from an IRA to establish a scholarship endowment fund. It allows students from the Milwaukee area to attend the same small, private university that Tom did. “I had thought about it for many years. I always contributed, I always donated annually for general requests.” But Tom wanted to do more to “pay it back” to his alma mater. With this arrangement, you can continue to take withdrawals from your retirement accounts during your life and benefit charity with the remaining funds when you pass away. A simple beneficiary designation form can be obtained from your plan administrator. To help those who might not be able to afford college, Tom says, “I wanted to help financially with the expense of an education…And this is forever! The endowment will help worthy students long after I am gone.” To Tom, that’s a significant part of the beauty of this gift: “Rather than just make a donation, this is something that will continue to help an individual student. It will still be giving in perpetuity. I am really grateful!” Tom and Jane value a college education. They continue to emphasize their family’s belief that education is a great prize to be cherished. The Dwyer’s contribution is a tangible gift that will help others realize the value of this prize themselves. Since 2006, Congress has intermittently offered opportunities for “Charitable IRA Rollovers.” When authorized, these rollovers allow an individual to make a distribution directly from their IRA to a charitable organization if the individual is at least 70 ½ years of age. The donor does not receive an income tax charitable deduction for the IRA distribution, but it does qualify as a mandatory withdrawal and is not reportable as income to the donor. For many individuals, this is a way to put retirement assets to work for the charitable causes they care about during their lifetime while enjoying the tax benefits. Please check with your advisor to see if this legislation has been renewed. How do you want to be remembered? Elise Ainsworth Brett was born in 1920 in Ames, Iowa, to Joseph and Helen (Rowan) Ainsworth. Her father was an engineer for the Army; her mother helped with naval personnel transportation. Elise had a brother named Joseph who was a talented artist, and she graduated from Northern Illinois University in 1943. Fresh out of school, Elise began her career as a home economics teacher in Fulton, Illinois. There she met William, her future husband; they married ten years later. Elise spent six years in Fulton and then taught at Smart Junior High School in Davenport for the next 34 years. Elise and William were married for 36 years; she retired in 1983. William died in 1989. They never had children of their own. Elise died in 2013 at the age of 92. But these facts donâ&#x20AC;&#x2122;t tell us all that we know about Elise. There is so much more we can garner from her legacy, so much more insight we have because Elise revealed what was important to her. From her bequests, we know what she valued, what mattered to her, whom she wanted to help. Teaching was her love and passion; Elise Ainsworth Brett influenced thousands of kids in her lifetime. Teaching was her love and passion; she influenced thousands of kids in her lifetime as an educator. She was devoted to music, culture, art; she had empathy for those with physical, mental health, and intellectual needs; she cared about the concerns of the elderly. Through her will bequests, Elise generously assisted eleven non-profit organizations, supporting the arts, culture and humanities, animals, health and human services, societal benefit, religion, and foundations, changing the lives of hundreds of Quad Citians over the decades. Elise knew that the summation of her life was more than a list of simple facts. Through her legacy, she told us what she cherished, what she most prized. And, she ensured that she would still be giving to these important causes long after she was gone. How do you want to be remembered? Bequest from Will or Living Trust One of the easiest ways to leave a legacy is by making a bequest to your favorite charity. You may desire to support charity but are unable to make gifts during your lifetime or maybe you want to continue to support charity after you are gone. A bequest is a gift made through your will or trust that allows you to retain ownership and use of your property during your lifetime and benefit the charity when you pass away. Many options are available when deciding how to include charity in your will or trust. You can leave a specific asset, a specific amount, a percentage of your assets, or the remaining assets after all other bequests have been made to family and friends. When providing for charities in your will or living trust, it is very important to talk to the charity before completing your documents. You want to make sure that your legal advisor has the correct legal name of each charity and that each charity understands and can carry out your charitable intent once your estate gift is received. That discussion with the charitable beneficiary of your generous estate gift will ensure that your philanthropic goals can become a reality. It is a great investment of time on your part! Easy to establish, providing reliable income Don and Lanora Welzenbach have called many places home during their 61 years of marriage. But their hearts belong in the Quad Cities. When they were growing up, Don and Lanora never ventured far from their home towns. Lanora was an only child born on a farm in Iowa. Don was one of five siblings and had lived no further than St. Louis. And life was hard. Following high school, Lanora worked full time because “there was absolutely no money for college.” She found her way to Park College in Kansas City. But after her first year, Lanora’s dad died, and she felt obliged to move back to help her mom. Writing for a local newspaper provided Lanora a living. Charitable Gift Annuity Provide security for your future. A charitable gift annuity is a contract between you and the charity you want to benefit. When you donate cash, stock, or other assets to the charity, they promise to make fixed payments to you (and/or another person) for life. Payments are based on the beneficiary’s age or the beneficiaries’ ages. A portion of the payments could be tax free and you will also receive a charitable deduction for making a gift. This gift option is a great way to receive some benefit from lowinterest CDs or under-performing stocks while you help your favorite charity or charities. After the lifetime of the annuitant(s), the amount that remains from the original gift is available to use for the charitable purposes specified by the donor. Don continues to tell the oft-told story, “We got engaged in 1952, and then I got drafted. After 16 weeks of basic training – yes, 16 weeks – I got my assignment for the Counter-Intelligence Corps.” The next year saw them married, beginning their global travels and growing their family. The college friendships and enduring ties to the Quad Cities eventually lured the Welzenbachs back home. “I wanted to give some money to the school, and I also wanted to provide for Lanora.” A charitable gift annuity was the answer. “Lanora had worked all this time, we put the kids through college, we paid for the house. She would get a small annuity and social security, but I thought she could use more. With the gift, the college gets to invest the money, and Lanora gets paid too. It is a good way to give to your alma mater and at the same time provide some additional benefit for your spouse.” The Welzenbachs are two people who know the value and worth of education. Their generous gift will help future students find the educational key to their own success. People often make gifts to organizations when and where they feel they can make a difference and have an immediate impact. Those gifts are welcomed and celebrated as the organizations are able to meet immediate needs. But, what about the future? If an organization is important to you now, wouldn’t you like to see it continue to accomplish its mission for years to come? Gifts to endowment allow you to do that. Gifts to endowment are carefully managed by the charity receiving them to provide permanent, ongoing support for its mission. Endowments exist in perpetuity. The endowed fund is invested for long-term growth and only a specified percentage (typically 4.5 percent) of the market value is spent each year. The goal is to establish a payout that will be high enough to make a meaningful difference, yet reasonable enough to allow for growth of the fund’s value. To the extent that investment returns exceed the payout, the endowment will retain its “purchasing power” from year to year. Thus, endowed funds established over a century ago – or even longer – are still making a difference in the lives of our generation. These endowments – and the legacy of each endowment donor – endures for future generations. The benefits of endowment for you and your favorite charitable causes are many: • Continuation of mission. In times of government funding cutbacks and other challenges, an endowment provides a reliable source of revenue for a charity. Charities exist to meet needs in a community, and to meet these needs charitable organizations must have dependable resources. • Investment in the future. An endowment gift allows a donor to make a permanent contribution to the community’s future. As an ongoing funder, the donor is invested in the success of the organization today and is ensuring its success for tomorrow. • Continue annual giving past your lifetime. If a donor loyally supports a cause every year, the charity will have to find new supporters after the donor’s lifetime, because the annual gifts will cease. An endowment gift is a perfect way to ensure that your annual support continues for the future. • Providing for innovation and growth. A strong endowment allows a charitable organization to grow and adapt to the changing needs of the community it serves. While we can not anticipate need of future generations, know that Donor GiftseveryInvestments Earnings weOrganization there will be challenges ahead. • Tax advantages. Planned gifts are perfectly suited for endowments. Donors who make gifts to endowment can enjoy income, capital gain and even estate tax benefits. Thinking of including an endowment gift in your estate plan? Please consider: 1. Selecting an organization whose mission matches your passion and provides services that will still be in demand for generations to come. 2. Finding a strong organization with a long history of service, fiscal responsibility and solid governance practices. Having these in place assures that the organization will continue to serve for years to come. 3. Consulting with the organization to ensure that your endowment will help them where they need it most. Knowing about your gift now will also give them the opportunity to thank and honor you for your support while encouraging others to support the endowment as well. SAVE TAXES UP TO THREE TIMES Giving through the Community Foundation to the causes you care about is rewarding—in more ways than one. Your gift creates lasting change in the community, and the Endow Iowa Tax Credit Program offers you generous tax incentives to make it easier for you to give more for less. Iowa taxpayers who give to a permanently endowed fund that benefits Iowans at a qualified community foundation, or one of its regional affiliates, are eligible to receive a tax credit equal to 25% of the value of their gift. Thus they can save taxes up to three times: •	25% tax credit •	federal income tax charitable deduction •	capital gain tax savings enjoyed by donors who use appreciated property We’d like to give special to these individuals and businesses (stocksrecognition or real estate) for their giving rather than cash who helped in the creation of this publication. Members: Sally Crino, Carol Foster, Alex Kolker,Illinois. Barbara Melbourne, TheCommittee Community Foundation serves eastern Iowa and western The Endow Iowa Tax Credit Program is Scott Park, Linda Wastyn, Wilson our communities every day. Similar legislation inspirational to many other states because it worksTerry to strengthen Designed Amyand Fossum, Moline Dispatch Publishing LLC Contact us for more information. is pending in by: Illinois, we are hopeful that it will pass in Company, the near future. If you're not already sure what you'd like to accomplish with your giving, follow these five simple steps to clarify your goals. A Golden Partnership " I've been very, very lucky, and I know it. I don't take any of this for granted." met Gary on her 15th birthday, “But my mother wouldn’t let me date, so I had to wait. Later, she gave in. We married in 1970.” Gary trained to be an auto mechanic at a trade school in Kansas City. They lived in Chicago, where they worked out of their home selling and ordering transmission parts. “But Gary was homesick. I loved the city life, but he wanted to go back - so we did. I nudged him to start his own business. We had the inventory in our basement.” Deciding to break out on his own took a little convincing, and starting a business was not easy. “We scraped up whatever we could. It goes without saying,” laughs Lorraine, “that we didn’t have much money.” They both enjoyed getting involved in the community, but it was Gary’s involvement with the North Scott Rotary that became his passion. “He served as club President and was a model Rotarian,” says Lorraine. Lorraine continues the philanthropy that she and Gary started as a couple. She too is active in Rotary among other charitable causes. Lorraine still owns and operates Mid States Transmission Parts with many long-time employees. “I have a corporate background. I worked for bigger companies, so I know how to run a business,” Lorraine states. Looking to be strategic and organized with her philanthropy, Lorraine turned to the Community Foundation. She established the Golden Lynch Foundation Fund, a non-endowed donor advised fund. The name reflects Gary and Lorraine’s shared love of Golden Retrievers -their children, as Lorraine refers to them. She decides the timing of her charitable gifts into the fund, and then makes grant recommendations to the causes that she wants to support at her convenience. Lorraine started a similar fund, the Mid States Transmission Parts Foundation Fund, to organize the business’s charitable giving. She uses her online account to manage both funds and recommends grants to the causes throughout the community. Her third fund is called the Golden Lynch Humane Society Endowment. From this designated endowment, the Humane Society of the Quad Cities receives an annual distribution in Lorraine’s name, and in Gary’s memory, to support its work. She also has provided a bequest to the Community Foundation. It will be added to the Golden Lynch Foundation Fund, which will become a permanent endowment after her lifetime to support specific charities. Through this fund the causes that mattered most to Gary and Lorraine will be taken care of for generations to come. • What causes do you care about? • What organizations do you currently give to? • Where do you volunteer? • When you make a charitable gift, what gives you the greatest satisfaction? and advice. • Seek information about new or additional charitable opportunities from the Community Foundation. • Prioritize the needs, programs, and opportunities of your selected nonprofits. Create Your Plan • If you could change three things in your community, what would they be? • Determine best giving instruments to accomplish giving goals. • Make gifts or grants. • Do you prefer to fund buildings, operations or projects? • How much involvement do you want with the causes you support? • What are your family priorities? Review and Update Your Plan Working with our philanthropic services team, evaluate results: • Did your gifts accomplish what you hoped they would? • Has your financial or family situation changed? • What are your financial objectives? • Are there changes in tax law relevant to your giving? Our Regional Community. Our Foundation. 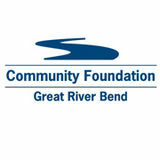 Since 1964, the Community Foundation of the Great River Bend has been a growing, futurefocused, locally led organization with a very passionate and committed Board of Directors and professional staff focused on unlimited possibilities for our Regional Community. Great River Bend is governed by an elected Board of Directors with broad and diverse representation from our community. Each affiliate is led by a local advisory committee of dedicated community leaders. Foundation is a bridge joining people with PASSION, COMMITMENT, and a COLLABORATIVE SPIRIT. Together we challenge the status quo and create cool, creative, and prosperous opportunities for the benefit of our Regional Community. FINANCIAL MANAGEMENT The assets of the Community Foundation are a testament to the generosity of our donors and their belief in our mission. The Foundation's board prudently manages all assets in accordance to stated polices developed by an Investment Committee comprised of recognized leaders in finance and asset management. The Community Foundation has sustainable distribution and investment polices to help ensure that funds “purchase” the same impact in the community decades from now as they do today. Our oldest fund was established in 1928. It has granted out far more than the initial gift value and is still growing! HISTORY The Community Foundation began as “The Davenport Area Foundation.” It was established by a small, dedicated group of community leaders. Their original vision was to pool the charitable resources of area philanthropists, living and deceased, into a single, great, and permanent endowment for the betterment of the city of Davenport. In 1994, the Davenport Area Foundation became the “The Community Foundation of the Great River Bend.” Our new name reflected our growing Regional Community and our organization’s growth in community leadership and civic engagement throughout the region. INTEGRITY The Community Foundation of the Great River Bend is confirmed in compliance with the National Standards for U.S. Community Foundations, voluntarily adopting policies and procedures to guarantee that we conduct business not only legally, but ethically. National Standards accreditation represents operational effectiveness to foster excellence in community philanthropy. We were among the first five community foundations in the country to achieve this accreditation. SERVICES Professional staff at the Community Foundation is available to help you define your philanthropic goals, discuss your charitable giving plans, or to help you evaluate giving options. We work with you and your tax, legal and/or professional advisors to come up with the best plan for your situation. For more information or to set up an appointment, call 563-326-2840.